Where there is injury let me sow healing. We our team, families, patients, and our work. We use standard of care, as do our labs and suppliers. We will deliver compassionate, high quality affordable health services. Healing occurs from above down and inside out. Healthy by choice... not by chance. It is our mission to uphold the highest standards of customized care. Kids and Chiropractic ... A healthy choice! 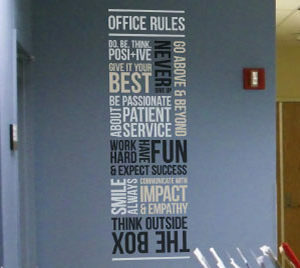 ‘It is our mission to uphold the highest standards of customized care’ is a great mission statement for any health facility. 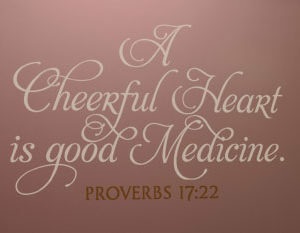 These words are a constant reminder to doctors to do their very best for their patients. They will therefore look great as signs in the hospital and as wall decor too. This quote and nine others are very motivational words that encourage the doctor fraternity to go an extra mile. They are available from WiseDecor as vinyl lettering. You also have the option of using your own original quote or a favorite one from a different source. 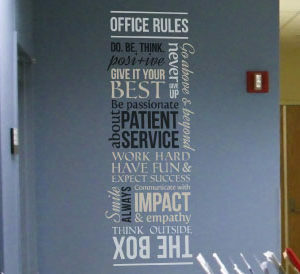 We will work with either to create vinyl lettering and signage. You may apply them in the doctor’s office, reception, hospital corridors and rooms where doctors gather and frequent. The options are many! Applying these vinyl letters is an easy job. It takes only ten minutes. Remove the underlying sheet and apply the adhesive side to the wall or flat surface of choice. Since you get to choose the colors, style and size, these wall accents will blend in well with the rest of the decor and furniture in the room. They are also very affordable and we have an excellent rewards program. Sign up and take advantage of the benefits. 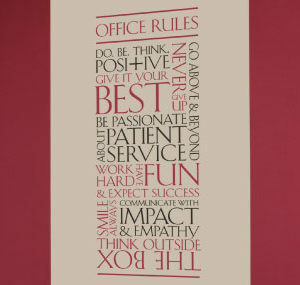 If you are looking nfor doctor decorating ideas with words and quotes, go for WiseDecor products. You may get in touch by calling or through email. We look forward to hearing from you.